Canon Pixma G4510 Review – We’ve been fairly impressed by the progress of Epson’s EcoTank bottle- refilled inkjet printers, even if they are so expensive that it’ll take you several thousand pages to benefit from the lower cost of ink. This model from Canon’s rival Pixma G series is cheaper, although we couldn’t find any retailers beating the manufacturer’s own price. Canon Pixma G4510 Review: CARTRIDGES OR BOTTLES? The G4510’s big. robust case and old-fashioned control panel, with lots of buttons and a calculator-style LCD screen instead of the colour touchscreen you’d expect nowadays, mark this out as a product you’d choose only for mundane practical reasons. There aren’t many frills to speak of. Neither the printer nor the top-mounted scanner, with its 20-page document feeder, offer duplex (double-sided) output, and although Wi-Fi and online printing are supported you only get a USB 2.0 wired connection, not Ethernet. Fax is included in case you’re buying a printer for the prefab office in the corner of a scrap-metal yard in an old episode of Minder. Printing was slow in our tests, barely reaching eight pages per minute (ppm) for black text and 2ppm for colour graphics on plain paper. Quality was fine for these documents, but photo printing wasn’t great – you’d expect better from a a much cheaper inkjet. Although the scanner isn’t very high resolution, the results for everyday purposes were excellent. At 16 seconds for one page, or nearly three minutes for 10, photocopying wasn’t particularly quick, and colour more than doubled these times. The trade-off is that you get over 6.000 pages’ worth of ink included (or 2,000 postcard-sized photos). So despite the fact that the G4510 is about five times more expensive than the kind of bog-standard multi-function printer that has similar features, you’ll start saving money after printing only half of those pages. That really highlights how expensive ink cartridges are. Even if you bought unofficial refills for a standard inkjet, it would eventually work out pricier. When topping up. Canon’s bottles don’t prevent you inserting the wrong colour, but we found them simple to use. 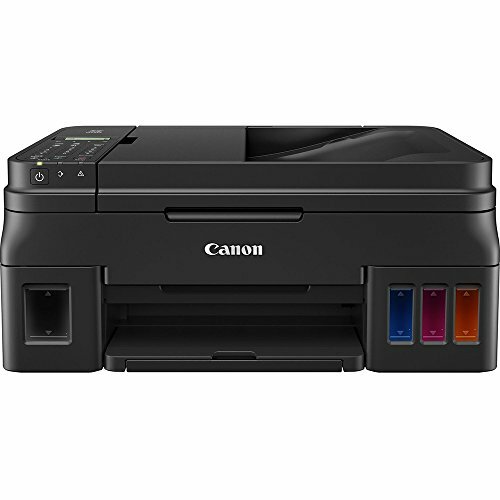 It’s good to see Canon making the ink tank system more affordable – the range starts at £170 for the G1510 (without a scanner). But the upfront cost still feels high for a basic printer. At a time when we’re giving up plastic drinking straws, it’s scandalous that the disposable cartridges for inkjet printers contain as little as half a teaspoon of ink. That’s to make the unit price low enough for us to feel like we can afford it, while maintaining a price per litre higher than upmarket perfume. The profits subsidise the printers. Ink-tank models print pages the same way, but are refilled from bottles (see image). This doesn’t inherently save money – the price of ink has little to do with the actual cost of anything – but manufacturers choose to set a lower price for bottled ink and charge more for the printers. Those who print multi-page documents every day will save money over the life of the printer. For occasional use, it may not make sense. If you stick with a cartridge printer, all the major brands offer postage-paid envelopes to return your empties for recycling (see www.snipca.com/28124 for Canon). Or if you want to save money, you can buy unofficial recycled refills – the quality varies, but for most purposes they should work fine.